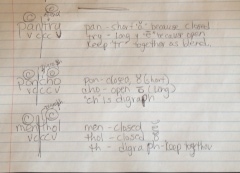 Now that we have gotten through the more challenging VCV syllable pattern, we can move to the next in line – VCCCV, Vowel-Consonant-Consonant-Consonant-Vowel. Even though it looks longer and possibly more challenging, this one requires less work to break up than VCV. If you have not yet read the posts on REVLOC, VCCV, and VCV, I suggest reading those and coming back to this post. OG is a system that builds one section of lessons upon the next. 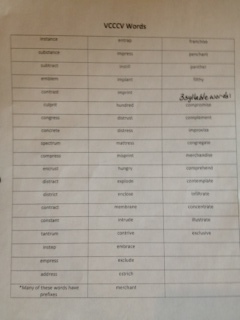 This is the section called Syllable Division Rules. The class I took, we called the VCCCV pattern Ostrich words. The main rule about Ostrich words is that when dividing, allow the consonants that go together to stay together. Those that would go together are blends and digraphs. 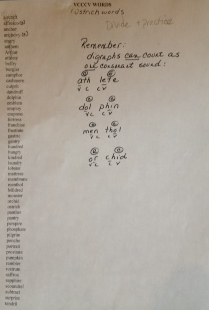 I have not yet posted on blends and digraphs, so I will give a brief description here and plan a more in depth post next week. A Digraph is consonants that come together to make a new sound. Examples would be, th, ch, tch, sh, wh. Notice that we do not say, “t” “h,” we say, “th,” as in think or “c” “h,” we say, “ch,” as in chimp. The letters are together and being pronounced as one sound. A blend is when consonants come together and we can hear both sounds. As in, bl, (blind), cl (climb), nd (found), st (lobster), gr (pilgrim). It doesn’t matter where the blend appears in a word, you can hear each letter clearly making its own sound. So, going back to VCCCV, Ostrich – this is the breakdown of that word. Here are a couple more examples of VCCCV breakdown. Below are examples of words with VCCCV pattern . I shared this on FB! Thanks again. I always look forward to your posts! Thank you so much for letting me know. I love OG and happy others are as enthusiastic about it as I am! I love your articles. But the worksheets are too small and I cannot see it clearly. It’s a pity. I’m sorry they are small. It’s hard for me to create something that is usable and not infringe on the Intellectual Property rights of the school where I received the material. I’m working on something, so I hope you will stay tuned! 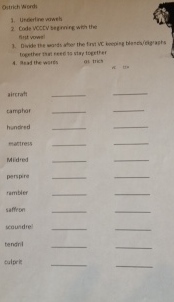 Where do you get your worksheets from? I usually make my own but haven’t found a good resource. I get the worksheets from the school where I took the class. I would be happy to post them, but I have to be aware of Intellectual Property rights of the school. I haven’t yet found a way to make them into my own material.